2. In the Left side admin menu, expand the Program/Registration Setup section and select Create new Program. 3. This screen will show a few options of different registration types available on Athelink. Press under Tournament Tracker. 4. Fill our the required information and press . 5. Athelink will take you through a wizard that will ask you information about your event so that it will be easier to organize. 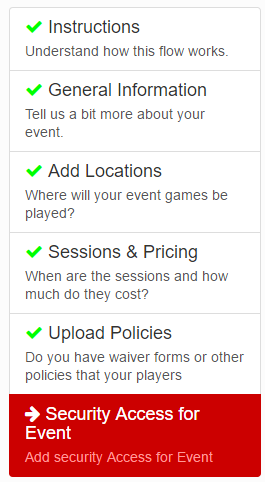 Registration Form - Finally the part you want to get to! This part of the Wizard allows you to setup every aspect of your registration form. For more details Click Here. Setup Online Payment - If you have not already connected your methods of payment, this allows you to accept Electronic money transfers (Canada), Cheques, and Credit Card Payments via PayPal. Invite People - If you have a mailing list, you can send out the link to registration to all those that you add to this box.